A revamped system of junior doctors' training, emphasising areas including communication and safety, is being introduced in the UK from this week. The two-year foundation course begins straight after medical school, replacing existing house officer years. The British Medical Association has welcomed the changes to training, but warns some doctors going through the existing system cannot find jobs. But the Department of Health says there is always competition for posts. 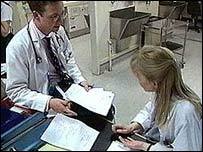 Just under 5,000 trainee doctors will begin the Foundation Programme this week. The first year will require them to show they are competent in areas including communication and consultation skills, patient safety and team-work, as well as the more traditional clinical skills. The second will include opportunities for experience in primary care and areas where there may be a shortage of doctors. Once they have finished the programme, doctors will take up specialist training posts, where they choose which area - such as gynaecology or surgery - they are going to focus on. This period of training, which precedes doctors becoming consultants, is also set to be overhauled. The foundation programme replaces the existing pre-registration house officer (PRHO) year and senior house officer (SHO) posts, which together can take three years or more before doctors move on to specialist training. Bill Kirkup, deputy Chief Medical Officer for England, said: "By making the continuous development of skills and knowledge central to training, and by making explicit the standards of competence that doctors reach before they progress, the Foundation Programme will improve patient safety as well as medical careers." Health Minister Lord Warner said: "This is just the beginning of a much wider ranging change in medical training, driven by the needs of patients and the NHS." But the BMA says the changes to training, where some SHO posts have been subsumed into foundation year two posts, have contributed to a shortage of posts. In addition, it says the number of posts for trainee doctors has not kept pace with the numbers coming out of medical school combined with the numbers of overseas doctors who want to be trained in the NHS. And medical deaneries, which accredit posts which provide sufficient training, are short of funds so cannot give educational approval to posts created by hospital trusts to meet service demand. Since these posts lack educational approval, they would not count towards the training of doctors who take them. The Department of Health has estimated only 122 house officers cannot find posts. But the BMA says this figure only takes into account those PRHOs who cannot find work, and does not take into account those at a later stage of their SHO training who cannot find posts. Simon Eccles, chairman of the BMA's Junior Doctors Committee, said: "This gives us an opportunity to achieve a streamlined system where a doctor's career progression depends on their ability rather than how much time they've spent at a particular grade. "However, while we support the principles underlying the new system, the way the transition has been planned has risked worsening workforce problems. "It is vital that carefully thought-out solutions are put in place over the coming years or workforce problems will worsen." Steve Webb MP, Liberal Democrat Shadow Health Secretary, said: "Improvements in medical training are welcome but the system must be well-planned and carefully monitored. "It makes no sense for highly trained doctors to be struggling to find work in the UK while patients are still waiting months for their operations."